My goodness, what a shock to the system this was!. The weather was far from violent over these last few days, in fact, we have been getting a sort of heat wave with temperatures much higher than average for this time of year in N. Ireland. According to the news some areas of the UK were hotter than Spain. On Tuesday the 6th I was in Coleraine with a friend when the car thermometer was reading an outside temp of 26 degrees C. High pressure was dominating the weather and every day it felt like an early Summer with strong sunshine. On the 7th it was another one of those hot and sweaty amazing days with hazy sunshine. I actually put a post on the UKWeatherworld forum about how the sky had 'that look' hours before a thunderstorm however no convective forecast had been issued by any of the usual sources. After sunset I had been out taking images of the crescent Moon and planet Mercury then for much of the night I was up late working on the computer. At 03.00 BST I decided to take a break and go down to the kitchen for a brew. I stood at the back door to check out the sky. It was a very warm muggy night with a very light elevated cloud base but even so, I could see many of the brighter stars. I was just about to retire for the night when a bright blue flash of lightning erupted from the NE horizon. I got quite excited and put the flash down to a freak event due to the heat, I decided to watch for a little longer in the hope of seeing another then things began to get very interesting indeed. Another blue flash in the NE, followed by another in the N, then E, then SE, all within a few min's, then I heard several loud rumbles of thunder. This was starting to get more serious, just as I was thinking this the lightning changed colour from blue to orange and began erupting all over the sky but seemed more concentrated in the S and SE. These flashes were like huge bombs illuminating the entire sky with electric orange then the thunder became more frightening. It was then that I began to see bolts from my back garden. I grabbed my camera and walked for a little up the road to one of my usual locations to get a better view. It was like someone had flipped a switch and all hell broke loose. There were multiple orange bolts dropping out from the darker clouds at random places all over the sky. The most visually stunning examples where in the S over Slieve Gallion and SE in the direction of Magherafelt. I could see bolts of all types hitting the ground and criss crossing the sky in all directions, this was now a very violent lightning storm and its unpredictability only added to the danger. I began to feel quite worried because yet again I was out in the open in a bad location surrounded by lightning. The lightning was moving S to N so the core would soon be upon me, and then it began to rain. I wasted no time in setting up my camera and began taking exposures. This is looking SE. I can't recall my exact settings but I think it was a 30 sec exp at ISO100 using the 28mm wide angle lens at F/2.8. This is the storm moving toward me. During the integration two In-Cloud (I-C) flashes lit up the storm cell from within which you can see in the form of the two bright orange enhancements. You can make out the dark outline of the cell base with a lowering of scud on the L. From there you can see a section of lightning. Above is the dark shelf cloud which looks to have two horizontal sections. There was a third event which took place during the exposure. 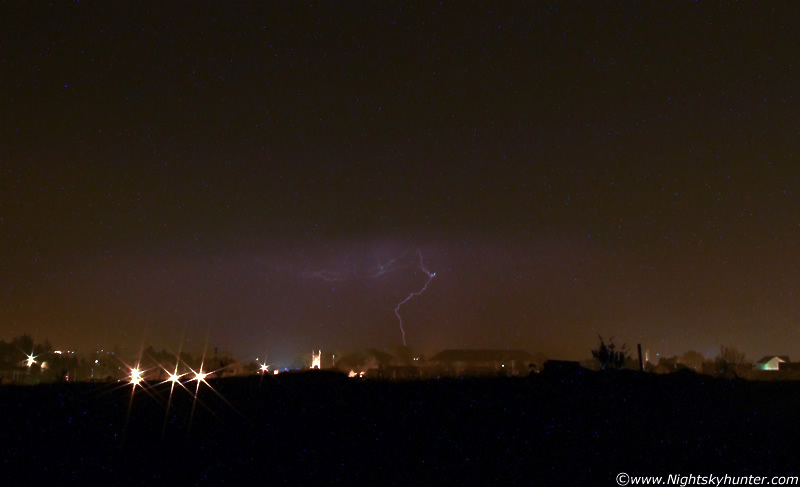 A stunning complex orange lightning bolt shot across the cloud from L to R on a horizontal plane over to the area where the town lights of Maghera can be seen. This was a spectacular sight with multiple branches which looked a little like an anvil crawler, however since this all occurred during the early part of the exposure the best of the bolts got obscured by the moving cell. You can also make out a dense curtain of precip in the background. The town lights illuminated this somewhat. I had no time to think about camera settings as everything was happening so fast but in hind sight I should have closed the aperture down further. (Lightning photography tips). I was only out in the open for 15 min's and during that period I took ten images and caught lightning on five of them which indicates how active this storm was. Who can complain with a 50% success rate. On most of the images the bolts appeared near the edge of frame so I had to bin them, however I did get lucky and got rewarded for my efforts by this capture. Still looking roughly SE here when this gorgeous orange cloud to ground (C-G) bolt struck Maghera near the centre of my image!. Visually it was a stunning sight which was followed by a tremendous long duration loud thunder crack which echoed through the still night for miles. The distance here is misleading because the wide angle lens makes the bolt seem further away than it actually was so I was fairly close. I was far from comfortable during this exposure because there were explosions of lightning all around me at random locations as the lightning seemed to jump for miles and hit the ground some distance from its source. I felt like an insignificant target at the mercy of mother nature in all her fury. The yellow building to the L of the bolt is St. Lurach's Chruch. The long flat roof to the R belongs to St. Patrick's College. The dark patches between these buildings are houses near the Hara road. The c-g appears to have struck the ground within the S sector of Maghera. I wonder if there was anyone up watching?. The lights LOC belong to the Senaco industrial area and the lights to the far L belong to Crewe Drive and Station Road. This is a crop of the same bolt. I think my camera needs a serious clean judging by the dust on the image or maybe it's noise?. With an ISO of 100 I would be surprised if it was. The bolt appears to hit the rooftop here but more than likely it struck down behind the house. It originates from the cloud base to the far left and sported a nice number of twists. This is probably my best lightning capture to date so I'm quite proud of this image given the circumstances. My first lightning capture was something I will never forget. It was taken during another nocturnal storm using a point and shoot camera with a 2 sec exp. In a previous report I said that I was determined to catch a bolt this year and now I have succeeded. I hope to catch bigger and better though, soon. Just after this image was taken I had the living daylights scared out of me. Another long orange coloured bolt shot out from the same cell, crossed the sky above my head sporting multiple branches, then hit the ground behind me in the N not far at all from me, and even closer to my house!. This was getting ridiculous and extremely dangerous, I would be a fool if I stayed out in this any longer so I grabbed the camera (it was in the middle of another exposure) and ran for my life!. The rain became heavy and danger was in the air. I couldn't get home fast enough, I know I was sprinting at high speed and only had to cover several hundred metres but it seemed to happen in slow motion like one of those annoying dreams where you can't reach your destination, the heat and humidity only added to the effort. In my minds eye I was already safe in my kitchen but yet it seemed to take forever to get there. I jumped the garden fence and arrived to safety as the sky erupted all around me!!. I was glad to be under a roof I can tell you. Thank goodness it was not one of those nights where I would be deep in the country taking astronomical images. If this had been during the prime NLC season I would have been in serious trouble indeed. I watched the rest of the storm from the open back door with the camera set up under the frame taking exposures and a few video clips. I felt secure but it was a false sense of security because I had read horror stories about lightning entering open doors and windows and hitting people within their homes. In one case a family had the front and back door open due to the heat when they witnessed a bolt pass through the front door and exit the back. I might sound like a bit of an alarmist here but no one should under estimate the danger of c-g (fork) lightning. I honestly believe the danger is down-played in this country. The reason being that violent thunderstorms are not common here but in my own experience, when we do get one, it's a darn big one. I love lightning as much as anyone else but I have respect for it. If you are a young person interested in thunderstorms then take my advice and be aware of your safety at all times. If you can hear thunder then you are already at risk of getting hit. Make sure you are not caught outdoors and if you can, get indoors or in a car. It's best to enjoy the action from a safer location so that you can live to photograph the next one. Out of interest, the colour of lightning can tell you alot about the atmosphere. Lightning takes on a range of colours, depending on conditions in the clouds and in the air. Blue lightning within a cloud indicates the presence of hail. Red lightning within a cloud indicates the presence of rain. Yellow or orange lightning occurs when there is a large concentration of dust in the air. White lightning is a sign of low humidity (amount of moisture in the air). White is the colour of lightning that most often ignites forest fires. This is a general rule of thumb however it's over simplified as expert Tony Gilbert explains, ''The colour of lightning is basically given by what elements/compounds are present to be ionized by the channel, and the colour is given by the emission spectra of those elements/compounds''. The storm continued with non-stop lightning and thunder which looked like a war zone. 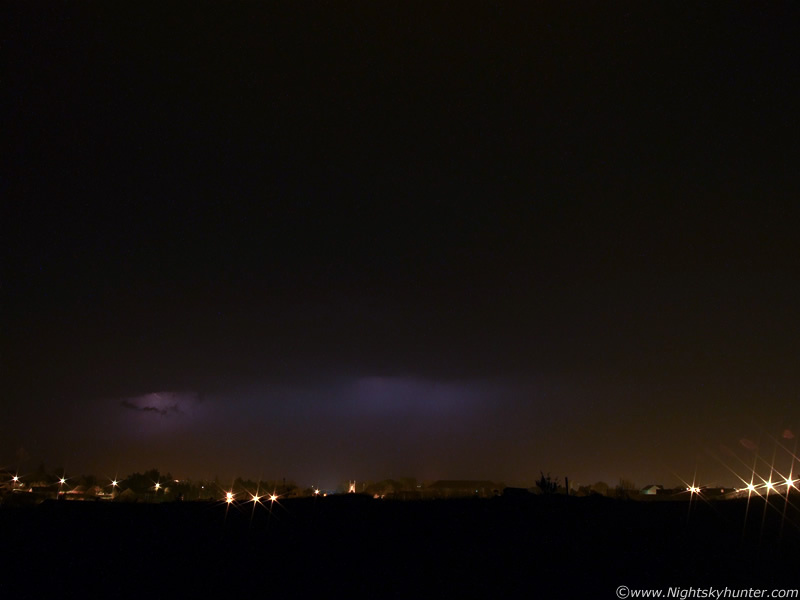 It eventually passed on at 04.30 BST but even then I could still see distant flashes and hear thunder. Was this is a severe storm?, there are a number of criteria which have to met to earn this label and this storm does not meet all of them, however for this country I would call it severe, to put it another way, I was able to watch violent c-g lightning non-stop for one and a half hours without any let-up, so it was a good storm indeed. 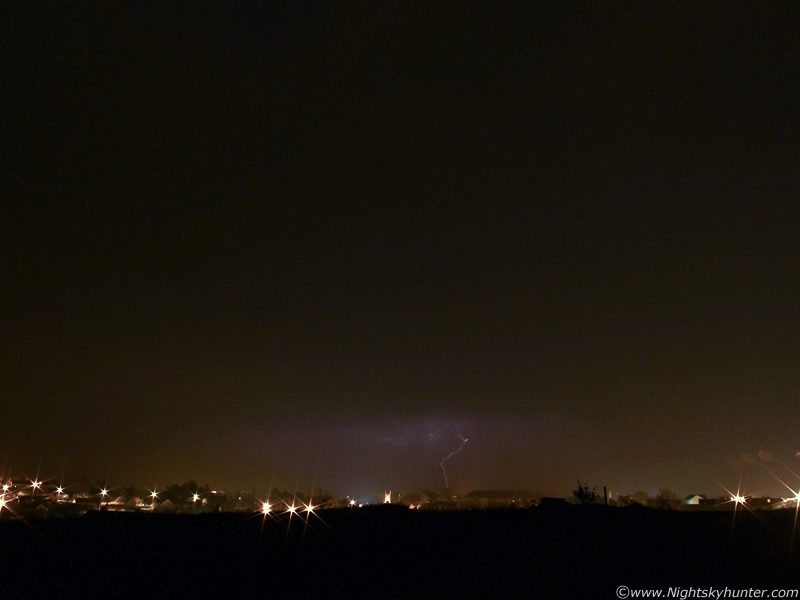 This was the first severe night time t-storm since 2006 so I was very impressed indeed. Thank goodness I was up late on the computer, otherwise I could have missed it. I wish I could add more to this account but it would be impossible for me describe every strike, roar of thunder, and the emotions associated with the experience. I hope this short account gives you some idea of what it was like. I hope I don't have to wait long for the next one. Above are three different video clips merged together showing some of the action. I was using the camera's movie mode and just stood within the frame of my back door and began recording. The camera is looking NE. The time was between 04.00 and 04.30 BST not long before morning twilight began to brighten the sky. I should note that this was taken when the storm was moving away to the N, at this time the lightning was less frequent but still unpredictable. At this stage it was more luck than anything else if I caught something because during the period the lightning was appearing at completely random sectors of sky. There would be a flash in the E blocked by buildings, another back in the S (to the R) and others in the W and NW. Since the NE sky was the only assessable sector this is where I concentrated on. There was fairly heavy rain falling which you can hear on the clip so it was still too dangerous to walk into the open incase of an isolated close range strike. I managed to catch 3 impressive rumbles of thunder and 1 flash of lightning. To experience the thunder at its best, turn up your speaker volume very LOUD. I have also found that plugging in ear phones enhances the experience. The video begins with a loud rumble of thunder at 00.08 which lasts until 00.35 for a duration of 27 sec's. At 00.50 you can hear me trying to comfort 'Drew' who is my little dog, he was terrified and ran into my other dog's bed for security, he was panting heavily. At 01.13 there is a bright blue flash of lightning in the NE, it briefly illuminates my neighbour's house. At 01.27 there is another rumble of thunder which lasts until 01.45 for a duration of 18 sec's. The last rumble of thunder occurs at 02.00 and ends at 02.26 for a duration of 26 sec's. The video then runs to the end where there are a couple of still images from above. It's a shame I didn't get video of the storm at its most violent stage because during this period I was taking time exposures without success. Next time I will focus more on the video. Early the next morning there was a lot of talk about this storm. It seems many people either seen it or heard it. I was talking with a few delivery men around 09.00 and they said the topic had been brought up to them many times that morning from members of the public. Looking back on the events which took place during the hours earlier I was amazed that no damage had occurred, there wasn't even a power cut. My Mum, who works in Coleraine, told me it was the main topic of conversation among her students that day. Apparently it was a nasty event when it passed over the Coleraine/Portrush area at 05.00. I was disappointed that the event didn't even make it to the local news on television so my first impression was that many people were unaware that it had even took place during the night. Many slept through the entire night without hearing a thing. I found out during Friday afternoon that this storm had developed over Dublin after midnight and swept its way up the country during the small hours of the morning and vanished over Malin Head into the Atlantic at dawn. 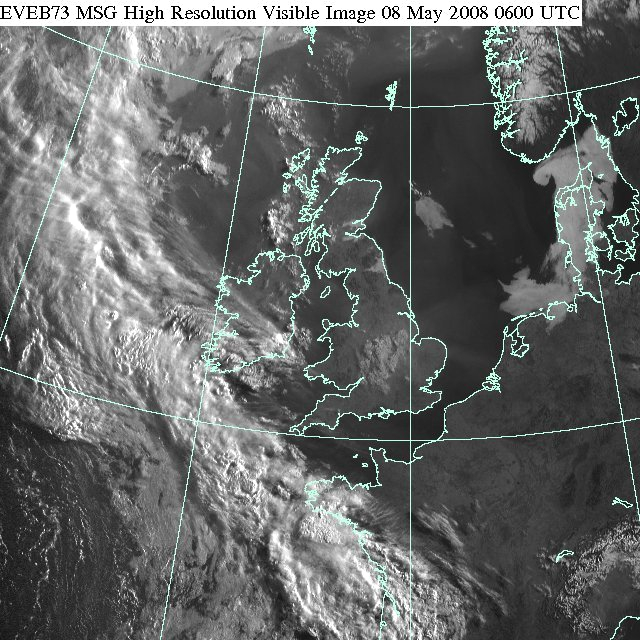 This is a visible satellite image taken from the Met Office website showing the scene at 06.00 UT on the morning of the 8th. Just off the N. Ireland coast you can see a train of giant convective storm clouds heading N (up). Those look like very serious looking cells. If you back track this image S (down) in your mind's eye you can see that the cells would have been straight over the Mid-Ulster area, and from night, the lightning would have been seen from a very large number of miles away. No one seems to know for sure what caused this storm, some suggested it was the remains of several thunderstorms over Wales which occurred during daylight on the 7th and others said it was some kind of plume event associated with a N moving trough. It completely staggers me that this storm was not forecast by anyone, and it was this shock which added to the storm's beauty. I will leave it to the experts to work out the synoptics. My instincts have told me that this season is going to be a good one for storms and so far they have been proven correct. This marks my third close range thunderstorm within a few weeks, two occurred in April then this beauty provided May with a sparky start. This also marks the second time in which I had to take cover for fear of getting killed by lightning. Next time I will take more of a risk to get better images and video but I don't want to get too cocky, all it takes is one bold move and I will never have another chance, so extreme caution will be exercised. On a closing note I feel deeply thrilled to have caught my first night time lightning storm of 2008, there were none during the 2007 season so I have high hopes for the rest of the season. Bring it on!.